Pentatonix fans get excited!! They’re on their way to BB&T Pavilion on Tuesday 14th August 2018, on tour with a brand new album!! With a mix of covers and original songs, it’s going to be an unforgettable performance! 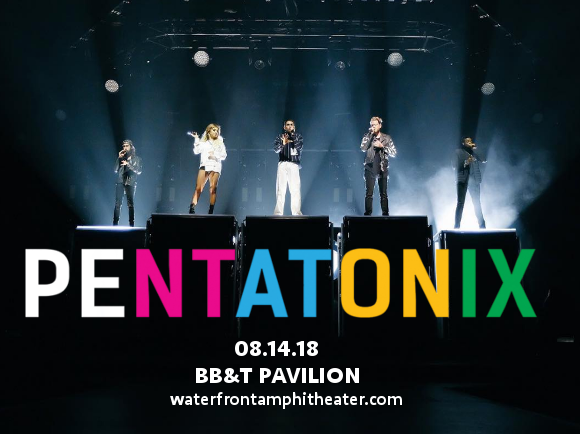 Get your Pentatonix tickets today!! Winning a recording contract after not only making themselves known to the general public on but going on to win the NBC show The Sing-Off, Pentatonix were dropped due to not being considered a viably enduring enough act on their own merit. Instead of getting discouraged, the group went solo, setting up their own YouTube channel – and saw infinite success. With their covers of songs by artists from Daft Punk to Michael Jackson, Pentatonix’s channel saw millions of views, rising to become one of the most-viewed channels in the world!! We can hardly wait to hear what else the band have in store on “PTX Presents: Top Pop Vol. 1”!